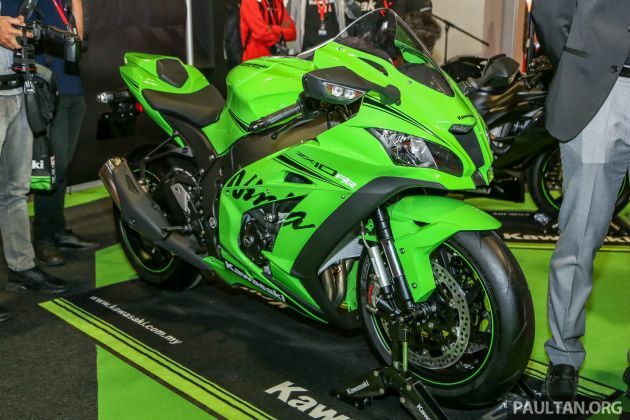 In conjunction with the Kuala Lumpur International Motor Show (KLIMS18) at the Malaysia International Trade and Exhibition Centre (MITEC), Kawasaki Motors Malaysia launched the 2019 Kawasaki ZX-10RR superbike and Kawasaki ZX-6R supersports, priced at RM159,900 and RM79,900, respectively. Prices do not include road tax, insurance or registration. As Kawasaki’s top-of-the-line superbike, the ZX-10RR is developed from the base model ZX-10R and designed to be as close as the public can get to the world championship machine ridden by Jonathan Rea. Carrying a four-cylinder inline power plant displacing 999 cc, the ZX-10RR produces 201 hp AND 114 Nm of torque. Now coming with Pankl titanium connecting rods that weigh 102 grammes less than previous, the ZX-10 RR’s crankshaft moment of inertia is reduced by 5%. Along with the use of finger-follower valve actuation instead of tappets, this allow for an increase in redline limit by 600 rpm. Settings on the fully-adjustable suspension have been revised to be more track-focused, complemented by lightweight forged Marchesini seven-spoke wheels. Coming in a limited worldwide production run of only 500 units, the single-seat only 2019 Kawasaki ZX-10RR comes in Kawasaki green and will be available at selected authorised Kawasaki dealers from April. Revised and updated for the coming riding season is Kawasaki’s supersports offering, the Ninja ZX-6R. Carrying a 636 cc inline-four, the ZX-6R now has stronger low- and mid-range torque, intended to improve rideability in the real world. New gearing improves response at the lower end of the rev range and a cassette-type gearbox makes it easy to switch gear ratios. This is coupled with three-mode traction control, selectable ride modes, and quick shifter as standard for riding performance on the track and road. Radial-mount brake callipers clamp twin 310 mm diameter brake discs, activated by a radial brake master cylinder with a five-position adjustable clutch lever on the left side. LED lighting is used throughout the ZX-6R, with the twin LED headlights inspired by the Kawasaki H2 and the tail light taking design cues from the ZX-10R. Inside the cockpit a large analogue tachometer has the warning lights on one side and LCD screen displaying other necessary information on the other. 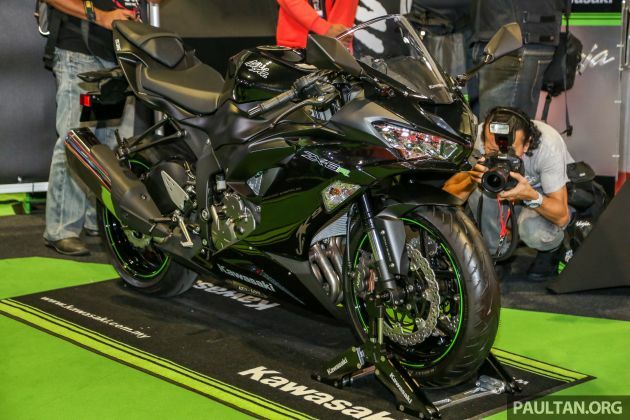 The 2019 Kawasaki ZX-6R is currently available in black and is available at authorised Kawasaki dealers from March. ZX6R supposed to be a lot cheaper than that. Even cheaper than previous model. I’m shocked. Greedy GM Lim. But serves him right. Kawasaki sales dropped tremendously in the last 3 years. This is New Malaysia. Everything is expensive now. i still remember around 1993 ZXR 750 is selling RM35k..